Review: The Suitcase. Derby Theatre. by The Market Theatre Johannesburg. (touring) – East Midlands Theatre. The promotional tag line for The Market Theatre Johannesburg’s play The Suitcase is A MOMENT, A HOPE, A CHOICE. In this play’s case (no pun intended) these are simple words that carry a lot of emotional and life changing weight. 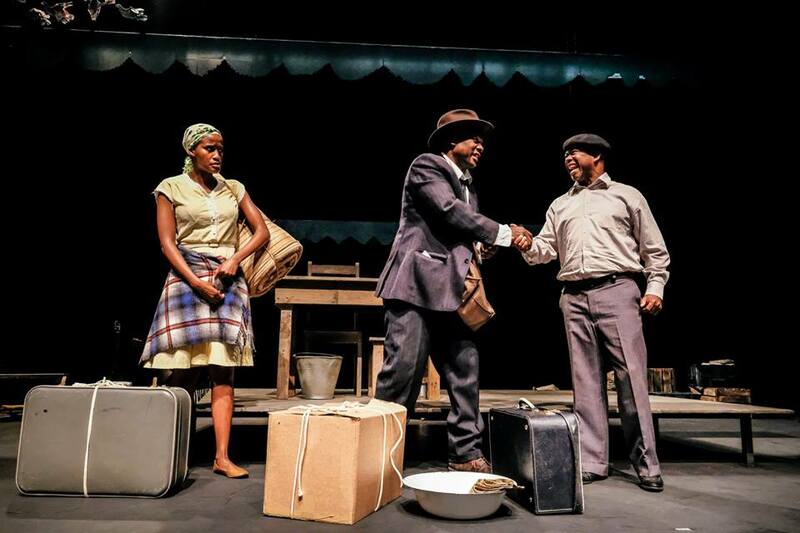 And in The Suitcase, currently playing at Derby Theatre until 23rd September, this seemingly simple story of a young couple named Ngobese, both escapees from the restrictions of their South African village, and keen for a new life in the city, is emotionally beyond simplistic. It is profound, witty and poetically beautiful with a deep wish for happiness and stability at its tender heart. 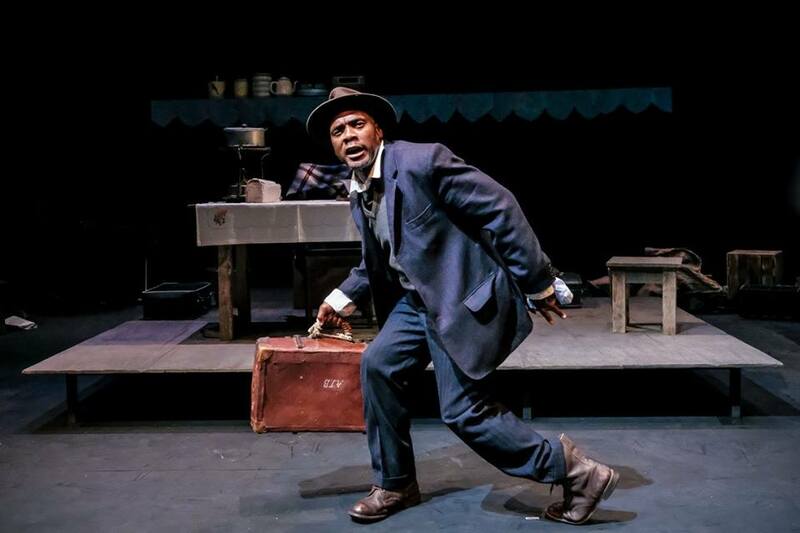 The Suitcase is adapted from a short story by Es’kia Mphahlele. 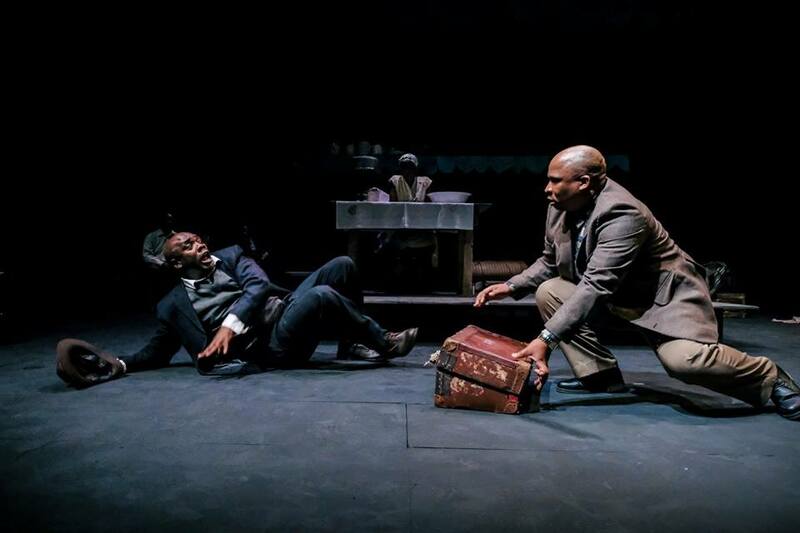 It is appropriate that The Market Theatre Johannesburg is called ‘The Theatre of Struggle’ for the dominant themes in The Suitcase are of continuing love through times of great struggle. It is a universal story of the experiences of migrants out of place in their own politically beleaguered country. 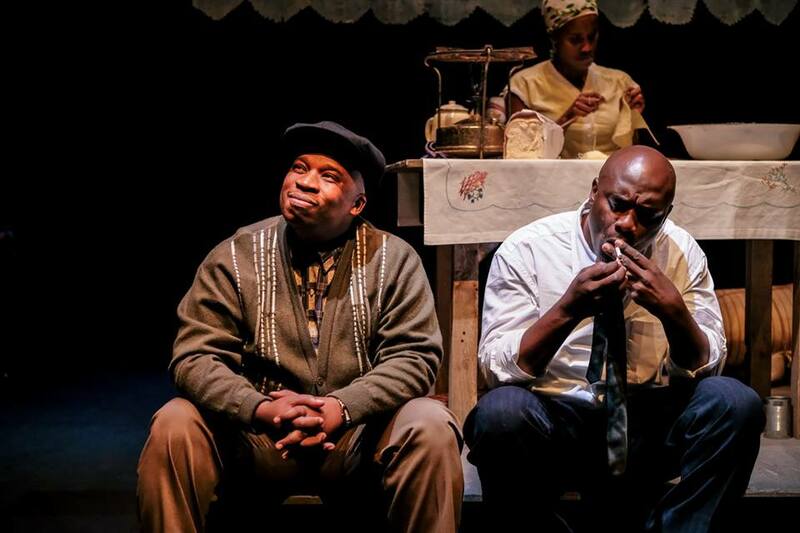 Invisible, but tangible in the air, is the sense of a dangerous world of 1950s apartheid and in the sincere, and most expressive playing of this piece, the audience feel truly transported to the dust, heat and poverty of South Africa. The acting is finely detailed and exquisitely mimed in parts. Using the languages of South Africa as well as English we really feel involved and genuinely care about the characters on stage. 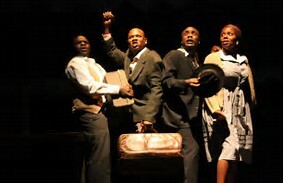 Finely directed by James Ngcobo The Suitcase includes authentic South African voices in text and song with music by Hugh Masekela. The cast includes well known names from South African stage and screen. They are all very fine actors and expressive storytellers and constantly engaging even in the silences. Siyabonga Caswell Thwala is Timi Ngobese and his wife Namhala Ngobese is played by Masasa Lindiwe Mbangeni. These are the naive young couple who flee to the city with their few worldly goods to start a new life and are befriended by Mlotshwa (Molatlhegi Desmond Dube) who offers them streetwise advice and a room to stay. Along the way they meet a variety of characters including the amusingly garrulous Pitso (Nhlanhla John Lata). Lata and Dube also act as storytellers and Lata is hilarious as a drunken man in the latter part of this one hundred minute one act play. Timi Ngobese makes big attempts to find work to support himself and his newly pregnant wife Namhala. The loving couple are happy in their love for each other despite their relative poverty. As the months go by Timi is still struggling and is now getting depressed about their situation. There ever hopeful state of being is starting to pale into darkness. Namhala tries to remain positive despite the odds. Timi is angry at himself for failing to attain work despite his best efforts and constant rejection. One day, in a moment of desperation he decides to steal a woman’s suitcase at the bus station. He hopes that the unknown contents will help his wife and himself in their desperate state. He panics and runs away with the case and is stopped by the police. The air is thick with anticipation about Timi’s new plight and the outcome. Well, as stated, a moment has occurred, an action has been taken and hope is in the heart of Timi. Now, the rapt Derby Theatre audience is hanging on to every action, breath and sound made on the stage. Will the contents of the suitcase change the lives of the Namhala’s forever? We shall see…The actors are superb in their inventive storytelling and in displaying even the tiniest emotion of the protagonists and supporting characters. If you love theatre then The Suitcase is a must see. Music and song play a large part in creating atmospheres on stage and the three lady actor/singers Gugulethu Shezi, Penelope Nomfundo Sambo and Nokukhanya Gugulethu Dlamini are at once uplifting and haunting in their singing. Whistles and trills startle and enliven our Western senses throughout. Guitarist Bhekisisa Sifiso Makhosonke Khoza adds support and great acoustic feeling to the work. The UK tour is supported by Derby Theatre, Hull Truck Theatre, Northern Stage Newcastle, The Dukes Lancaster and The Playhouse Liverpool. Review: Wreck by Toby Campion. Nottingham Playhouse. Neville Studio.